More messiness from me! It is in fact organized chaos, and perhaps a little old school, but there’s something satisfying about coloring in boxes. It just happened that I only had pink and yellow highlighters so that explains the limited color scheme. I used spreadsheets while I was writing the previous novel, but that system broke down when it came time to edit. I started tracking my progress in calendar pages back in December which was when I started with revisions. The days I worked on edits are pink, and yellow designates non-editing days. On each day I noted which chapters that I worked on. On some yellow days I also worked on outlines or brainstorming. Now I’m back to writing. For July, pink designates every day that I’ve written something. I’ve also noted down the total word count, daily word count, and the chapter I’ve completed (if any) in each box. Yellow days are days where I did not write, and to the left are my current chapter word counts. Averaging over the last few months, I’ve been getting about 22 days of writing work done in a month. I carry my notebook around with me and like to look back at months of colored blocks. Some days I write more than others, but you can’t tell which days unless you look closely at the numbers. Even writing just a little is still progress I’m happy with. The first draft is going pretty well. I’m 19k into it so far. Every novel poses a different challenge, and the first draft was very difficult for the first novel. This one has been going well so far! It’s like night and day mentally, but we’ll see what happens when I get to edits. How do you track your writing or editing progress? Heh, you know how I am currently tracking my writing progress. I track my writing progress by posting as I write, so I guess that tell me some things. (I had no idea that it had been nearly four years since I’d touched the WIP until I looked at the dates.) I never track day-by-day. I love the use of color! Very clear. I’m actually using a spreadsheet right now, also with using color. I guess I can put it up on Photobucket and share, heh. Here. 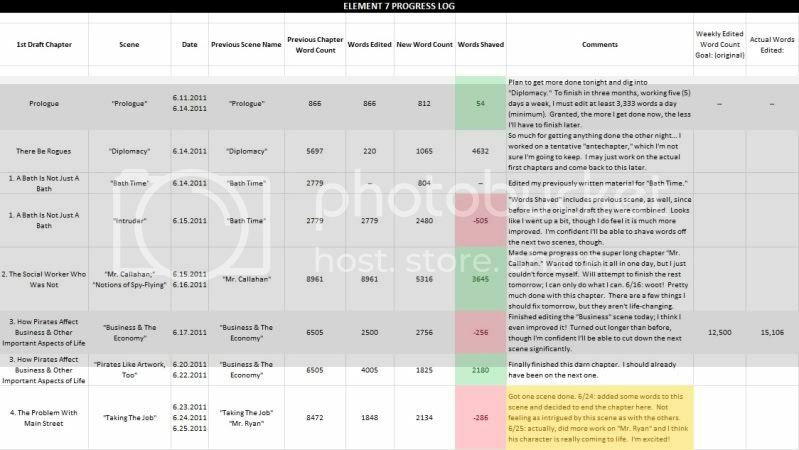 Basically, I note the chapter number and name then the scenes I’m working on, followed by the date(s); previous scene name (if I renamed it); the old chapter word count; words edited on a particular day or set of days (I try to keep everything grouped by scenes, so it just depends); the new word count; how many words I was able to shave off the old word count; comments; and finally two columns to keep track of general weekly goals. Also at the bottom (it’s cut off) I track the total original word count that I’ve gone through, total new word count, and total words shaved. A new week (or more like “working segment”) is indicated by a grey background, though I was initially irregular about considering seven days a week; like I said earlier, it just depends on if I’m still in the middle of a scene or chapter or not. (In my head it makes sense, though it may not necessarily make sense to others looking at it, lol.) Also, I highlight the blocks in the “Words Shaved” column red if they go up and green if they go down as an indicator of my pattern of wordage. *sighs* It’s working alright, though I could probably improve it some by starting a new row for each day. However, I prefer to think in terms of scenes or chapters completed, not by how many words I got done on any one day. It’s semi-organized chaos, for sure, haha. Wow you’ve done some massive shaving! 3k and 2k from a single scene 🙂 That’s impressive. I like how you track which days you remove and which days you add. I’ve found that my word counts stay pretty stable, adding from one place, and subtracting from another overall. I don’t track my writing progress…ops? Haha. I think its brilliant however that you track yours! I’m in revisions on my novel at present. I chart the progress quite simply: one chapter per day, unless it’s a very short chapter. If it’s a very long one that needs splitting up, I’ll handle all the resulting divided chapters. It’s worked so far! I usually have the chapter word counts on small post it notes that I stick to my wall. But for August I’m making a spreadsheet just to do something different. Next: What Is Sword and Planet?